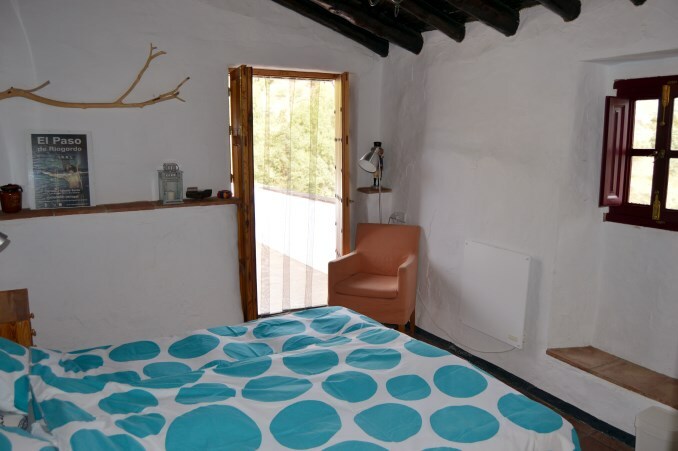 Our house is situated in a large garden with several terraces, pool and orchard and is arranged as a small scale Bed and Breakfast with two rooms good for a maximum of 4 people. 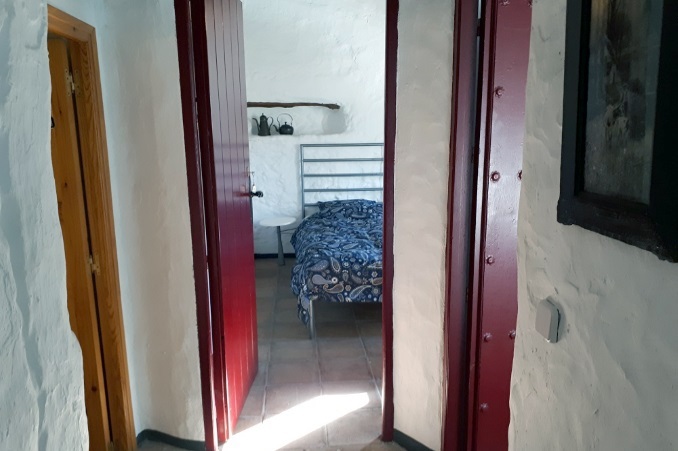 Situated on the first floor in this renovated farm both rooms have been decorated maintaining the andalucian atmosphere, but with the comfort of this time. 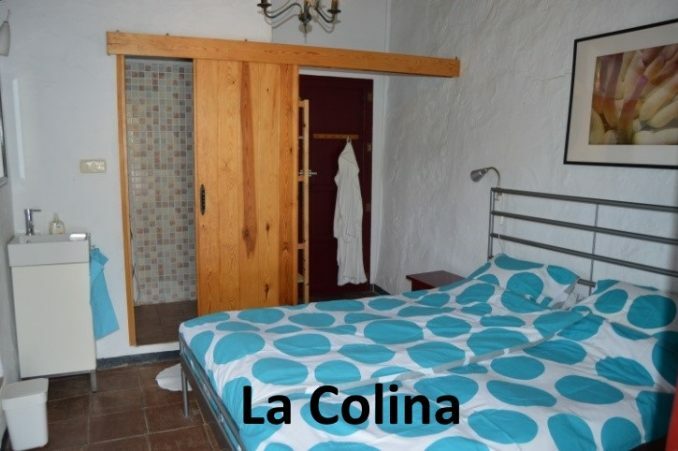 There are two guestrooms: La Colina with private en-suite bathroom and a roof terrace, and La Loma with a private bathroom, next to the room. Bathrobes are available in both rooms, towels get cleaned each day,if wanted, and (beach) towels are available free of charge. 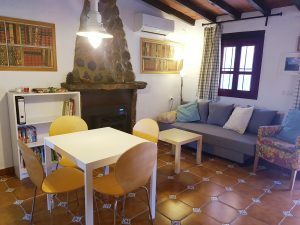 We now also have a family room available. 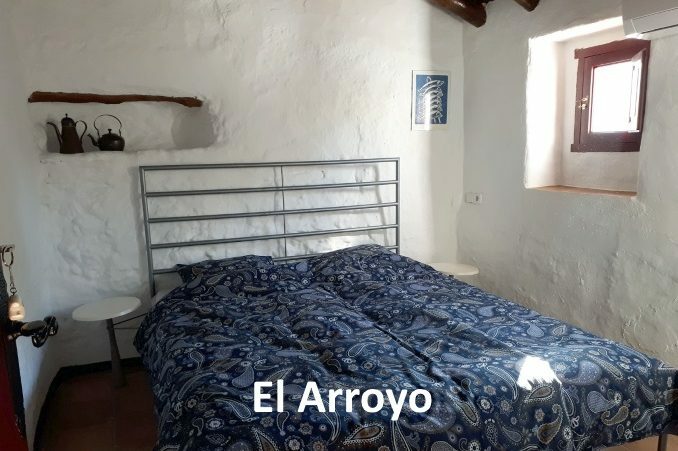 This is room La Loma and El Arroyo. The bathroom is in between these rooms and a door will keep you away from the rest so you have full privacy. 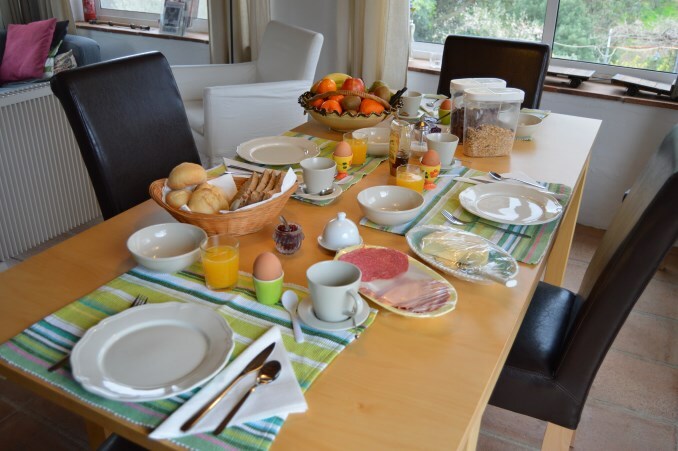 The rich breakfast includes among, other things, homemade brown bread, fresh juice of our own oranges and homemade granola is served in the living/dining room. 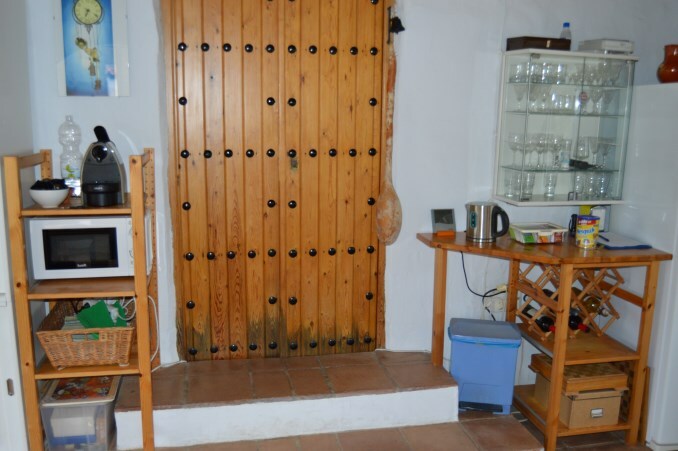 Here guest can make coffee or tea or get a drink from the filled fridge. 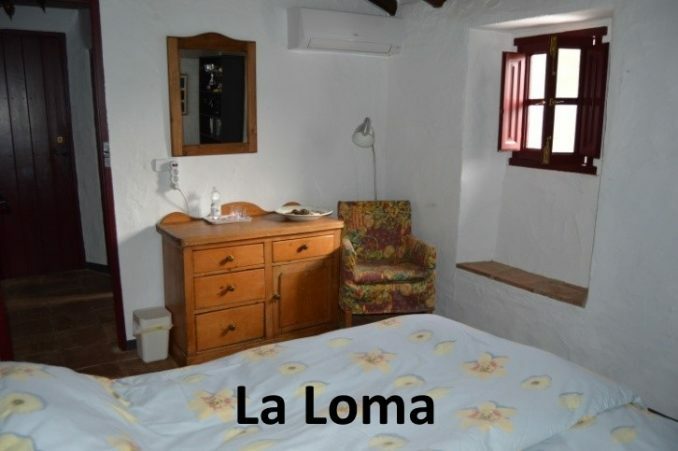 In case you find it to hot in summer; this room has air-conditioning, as well as room La Colina and La Loma. Here you can also find information about everything you can do in the area, books about nature and games. 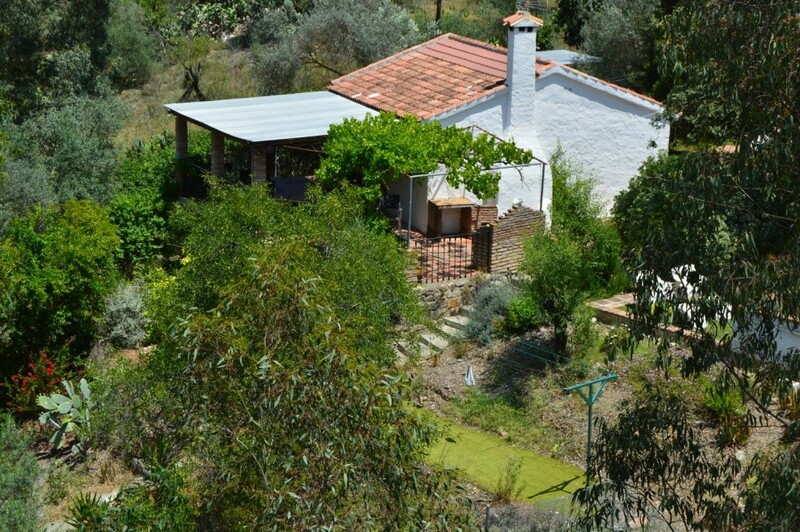 For those who want to cook, a fully equipped outdoor kitchen, with barbeque is on the terrace near the pool. Free Wifi is available everywhere. 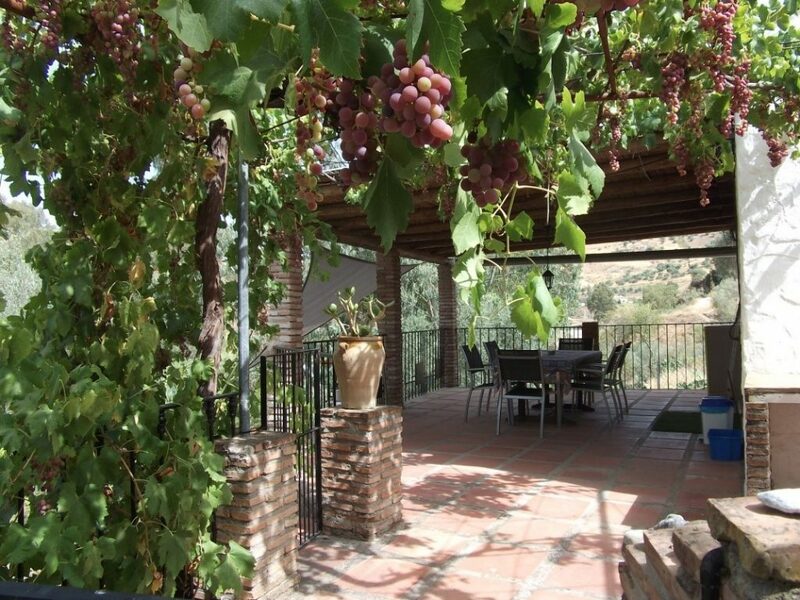 In the garden with different levels, there is a free standing guesthouse, El Olivo Comares. 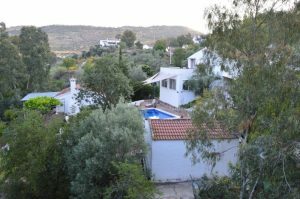 The cottage has a almost fully covered terrace, with barbecue, outside sink and beautiful view of the surrounding valley. 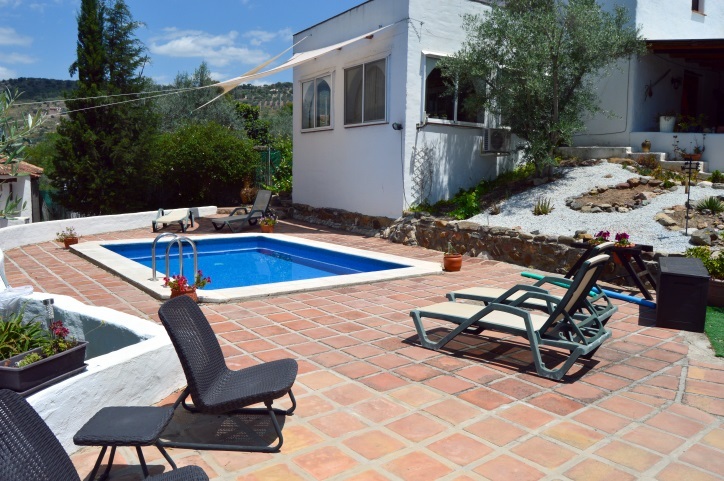 The swimming pool is behind El Olivo Comares, so you have the ultimate privacy on your own terrace. 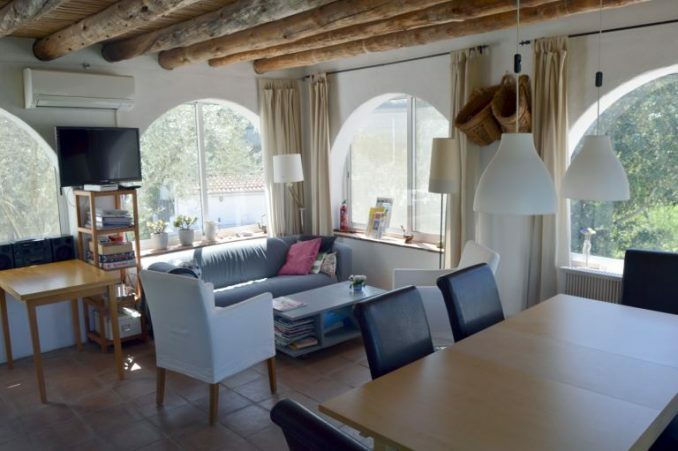 The cosy living room is equipped with a TV(satellite), DVD player, games, books and a pellet stove for the chilly evenings, and air-conditioning for the summer. 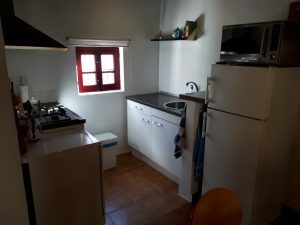 The open kitchen is equipped with a combi-microwave, dishwasher, fridge freezer, coffee-machine, toaster and 4 burner gas stove. 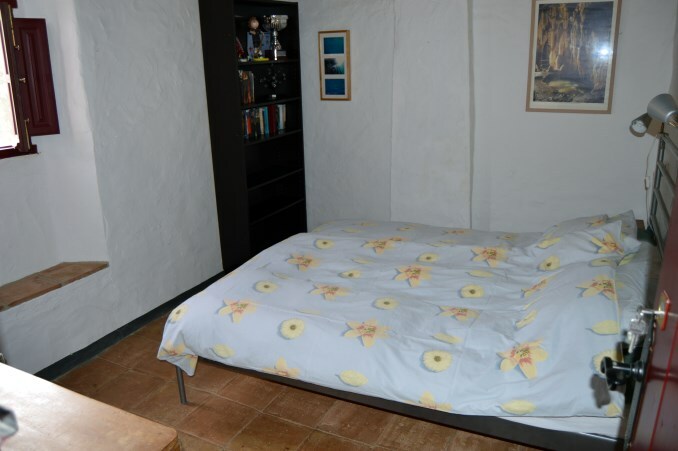 One room has a double bed of 1.60×2.00m, the other room has bunk beds (2x 90×2.00m), in the livingroom there is a sofabed. Both rooms have a wardrobe. During your stay towels and kitchen textiles are changed every other day, (beach) towels are available free of charge, and washing machines are available for free. The beds are changed every week ( in July and August twice a week). During the summer fans are available and the living room has air-conditioning.